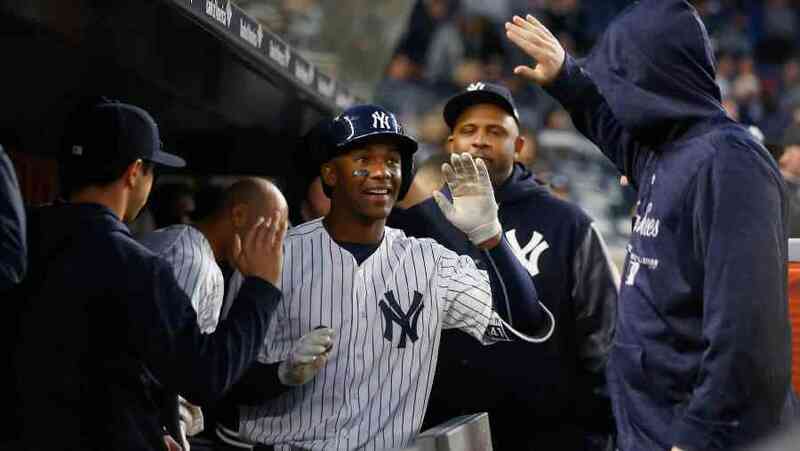 The big bats of the New York Yankees enjoyed a breakout night in the Bronx on Monday, headlined with home runs by Didi Gregorius and Giancarlo Stanton and younger faces like Miguel Andujar and Tyler Austin. Homers, like Andujar’s, which made history, were not the only hits on display during New York’s 14-1 win against the Minnesota Twins, as singles were also a big hit. The biggest single on the night was Gleyber Torres sending a liner through the middle for the 21-year old’s first ever major league hit, the youngster debuted for the Yankees the day before. Offense was considered one of the strongest parts to the Yankees team at the start of the season, but it has taken until now that is appears to finally have arrived in the Bronx. The wins are starting to come as well. The Yankees have now won three straight and six of their last eight. Andujar, who is the current third baseman filling in for an injured Brandon Drury, become just the third player in the history of the Yankees to collect at least one extra base hit in seven straight games prior to being 24. He joined the select group of Mickey Mantle and Joe DiMaggio. Andujar, through his interpreter, said that having his name mentioned in the same sentence as Mantle and DiMaggio meant a lot. Andujar turned 23 in March, and wasted little time joining the select group as he hit the first pitch he saw from Jake Odorizzi the Twins starter for a home run into the left field seats. DiMaggio’s seven-game streak for extra base hits was in June of 1937, while Mantle’s was in May of 1955. Andujar followed his home run with a double, which gave him 12 extra base hits over his last seven games. Stanton’s bat came alive on Monday as well, as he was 4-for-4 on the night with one walk. His home run during the fifth inning brought the full stadium of fans to their feet. Yankees manager Aaron Boone said following the game that he hoped Stanton could build on the momentum from Monday’s game so he can become the hitter everyone knows he is. The Yankees are now 12-9 on the season, five games behind the first place Boston Red Sox but have won six of their last eight and 7 of their last 10 giving their fans something to look forward to as May approaches.